Learning Bridge organizes training programs and workshops. A part of the proceeds from each workshop also supports a NGO like Child Rights & You (CRY) where young underprivileged children are taken care of. When one participates as a trainer or a student - one indirectly supports a much larger social cause. Vision /Mission of the Training – Developing Immunity against Stress rather than managing or controlling it. Exercising your emotions when you are already in a good emotional state so that you can remain emotionally healthy always. Practice, breathe & live this Emotional Intelligence Level as though it were an inborn quality within you. It is a set of Neutrally Inspired Exercises that have been specifically designed using the principles of Neuroplasticity. Practical tools and techniques to take away with you. Needs not more than 10-15 minutes a day to practice. High impact with immediate results. Builds more confidence to deal with any situation. A MUST for all levels of employees for the benefit of managing your and your team’s emotional quotient. To phenomenally improve your responses to challenging circumstances with positive attitudes. To develop and retain long lasting Personal Transformation leading to happier and more fulfilling personal as well as Professional life. Mehernosh J Randheriya is India’s First and Only Wealth-Wisdom-Wellness Coach and Trainer. Wealth - Mehernosh educates people in Financial Acumen for Business and in Personal Financial Fitness. Wisdom - Mumbai's First GTD Trainer, Mehernosh trains and coaches people on Creativity, Productivity and Mental Fitness. 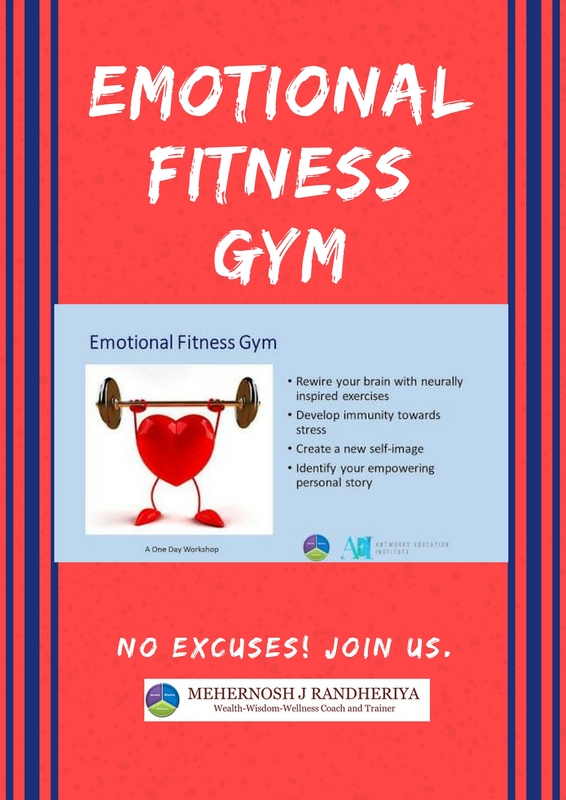 Wellness - India's First Licensed Trainer of Emotional Fitness Gym, Mehernosh helps people to enhance their Physical and Emotional Fitness. Course fee includes cost of Training, Training material, Lunch, Tea/Coffee with refreshments.